"Abita tries to focus on quality over quantity. We're prepared for growth, but the most important thing to us is our beer. We're not in a mad rush to increase sales, but we're always looking to make the best beer we can." Hurricane Katrina slammed into the gulf coast in 2005 and caused major damage in the areas of New Orleans and western Mississippi. Abita Beer, one of America's favorite regional microbreweries, is located in the quiet town of Abita Springs about one hour north of New Orleans across Lake Pontchartrain. Abita's microbrewing facility had portions of its roof torn away and endured a power outage for six days (resulting in a loss of 1,000 bbls of beer). Currently, the brewery is undergoing substantial growth and restoration. The Abita brewpub is situated in the center of Abita Springs, and visitors will be treated to the wide range of Abita's regular and seasonal beers as well as some of the most spicy, flavorful and satisfying brewpub fare available. The small brewhouse in the brewpub is no longer being used, and all beer comes from the microbrewery location. 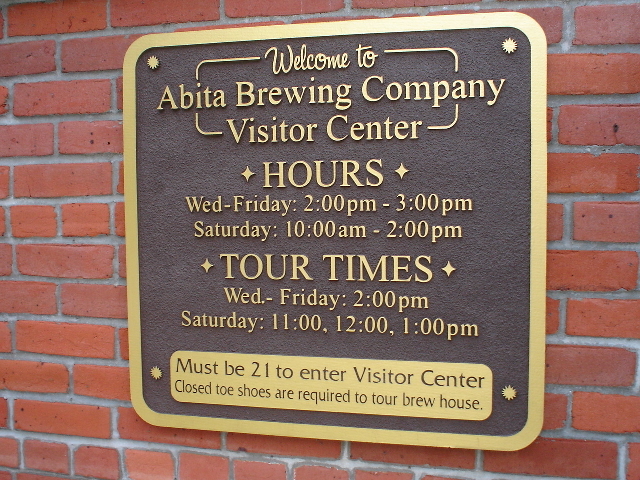 Abita's microbrewery is a very short drive from the brewpub on Highway 36, a beautiful new tasting room offers free samples of all the company's beers, and tours are available at the times listed on the sign below (no reservations required). The new visitor's center and tasting room opened in December of 2007 with the Abita Christmas party. Mark Wilson, Abita brewmaster, is extremely proud of the recovery and progress that the company has made over the last few years. Mark was an English/political science major and homebrewer when he started work for Abita 11 years ago, and it wasn't long before he was off to the World Brewing Academy held at the Siebel Institute in Chicago and at specific breweries in Germany. Much of Abita's success can be attributed to Mark's hard work and guidance. To accommodate increased demand in 36 states Abita has had to peel away portions of the roof several times in recent months (this time on purpose) to drop in multiple new fermentation tanks by crane. 14 new 300 bbl tanks were added in 2008 alone. The company sells most of its beer in Louisiana, but is now moving into Texas in a big way. 90,000 bbls worth of total production is the goal by the end of 2008. A state-of-the-art wastewater plant is also in the planning stages that will allow Abita to produce and capture methane gas to power its boilers. This will reduce environmental impact on the area and save the brewery thousands of dollars each year in power costs. The brewery prides itself in being as ecologically minded as possible and also uses recycled materials in its six packs and case boxes. Many of the processes in the brewhouse are now run by an automated Steinecker computer system that makes the operation much more consistent and efficient. Brewmaster Mark Wilson commented that the new system helps avoid costly errors in production. He also maintains that the system will help Abita produce beers with more consistent quality and flavor. Abita's popular Restoration Ale is a light English-style pale ale that was launched shortly after Hurricane Katrina. Abita donated a portion of the profits from the sale of each six pack to Katrina relief and has raised almost $600,000 thus far. Restoration Ale has sold so well that it will be continued as part of Abita's regular bottle lineup, but donations will soon be discontinued. Mark Wilson commented, "Continuation of the donations has proven to be very difficult given the complexity of our large distribution network. We have been very pleased that the beer generated so much money for this worthy cause." Andygator is the strongest offering from Abita and can best be described as a smooth blond doppelbock that comes in at 8% abv. Andygator sales have grown by a remarkable 100% in 2007, and the potent lager can be found on tap at many of New Orleans best bars and restaurants. Purple Haze is a refreshing wheat beer that is extremely popular in the hot Louisiana summers. It uses 100% raspberry puree added after filtration. Hints of raspberry sediment are noticeable in this cloudy beer that has a very pleasing fruity aroma and slightly sweet flavor. Abita has also released the very popular Jackamo IPA. The website states, "The newest Abita brew takes its name and inspiration from the Mardi Gras Indians of New Orleans. Looking for Indians on Mardi Gras Day is a tradition for many New Orleans families. A cultural phenomenon familiar to residents of the Crescent City, the Mardi Gras Indians are not well known to outsiders and Abita is proud to help share their story with the world." Jackamo is a spicy, hoppy ale with lots of rich malt for balance. Other notable Abita beers include their dark and malty Turbodog, light Golden Ale and Abita Light, and a nice variety of seasonals. When asked about the reasons why Abita has not only survived Katrina but is experiencing record growth and prosperity, Mark Wilson replied, "Abita tries to focus on quality over quantity. We're prepared for growth, but the most important thing to us is our beer. We're not in a mad rush to increase sales, but we're always looking to make the best beer we can."